Microsoft previously confirmed that Surface Pro will be released in the UK tomorrow, but we now know where it will be stocked. If you want to get hold of one tomorrow, Surface Pro will be available at John Lewis stores. The device will also be online at PCworld.co.uk and will also arrive in selected stores soon. Microsoft says the 20 people to buy a Surface Pro from John Lewis' Oxford Street store will get a free Office 365 One year subscription. Before an announcement last week, we only knew only that the Intel Core i5-toting tablet would launch in the UK - as well as 19 other countries - by the end of the month. Recommended pricing is £719 for the 64GB version, and £799 for the 128 GB model - having spent some time using Surface Pro, we think the latter size makes a lot more sense. And, if you're willing to spend this much on something that isn't an Ultrabook, the extra £80 isn't too high an extra cost for double the storage. Unfortunately the add-on covers aren't cheap, with the Type Cover costing a whopping £110 and the Touch Cover £99 - we'd wholeheartedly recommend the former over the latter. Unlike the Surface RT, which runs a dumbed-down version of Windows for ARM devices known as Windows RT, the Surface Pro runs a fully functional Pro version of Windows 8. Surface Pro is a full Windows PC that just so happens to be a pretty nifty tablet, too. We're big fans, although it is more than a little pricey. This month also sees the Surface Pro launch in Australia, Austria, Belgium, Denmark, Finland, France, Germany, Hong Kong, Ireland, Italy, Luxembourg, New Zealand, the Netherlands, Norway, Portugal, Spain, Sweden, and Switzerland. 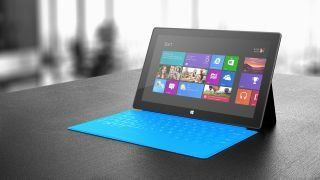 But it won't stop there - in June, the Surface Pro will launch in Korea, Malaysia, Russia, Singapore, and Thailand. Microsoft's UK Surface Product Manager Robert Epstein told TechRadar that the demand for Surface in the US was high, hence the delay in launching here: "That's why we're where we are today really, because of the success in the US. We're really pleased with how things are going. "[Surface is] two different propositions. Surface RT is a tablet with PC characteristics, Surface Pro is a PC in a tablet form factor." To be fair, the UK Surface Pro release delay is understandable considering what happened when the Surface Pro launched in the US. Surface Pro will get the Windows 8.1 update coming later in the year, while a new Surface is also rumoured, too.